Debbie G presented her proposed quilt exhibit guidelines at the Riverside Arts Gallery in Ypsilanti in March. Committee to select quilts will be: Debbie, Kim, Brenda (R-G? ), Amy S., Jackie M., Teri. Anyone else interested can contact Debbie or Amy D.
Dues due at tonight's meeting for 2017. The guild set up stations around the room where guests could visit and ask questions about various aspects of modern quilting - everything from fabric selection to binding as well as techniques such as EPP, paper-piecing, applique, etc. There was a good turnout and it seemed to be enjoyed by the existing membership as well. Seems like everyone was on target for their stalkee and everyone really enjoyed the mini-quilt they received. Next month's swap will be a "Challenge" (you get to keep what you work on) > The challenge is "use a novelty print in a project" and bring it to share of course! Due to the number of people who wanted to pull their quilts out for awhile, it was decided to put the RR on hiatus until January. Thank you to this month's snack bringers, Emily & Jody. Next month's snacks are Pam (snack) and Karen (drink). November 30: Last meeting at Calvary church, 1415 Miller Ave., Ann Arbor. Meet and greet at 6:00pm, meeting starts at 6:30. December 21: First meeting at our new location - the NEW Center, 1100 N. Main St., Ann Arbor. Same times. This meeting is our holiday party, so please feel free to potluck cookies or other goodies! Note for your calendar - the meeting is not on the last Wed due to the holiday. Then in January we are back to our schedule of last Wednesday of the month, at NEW Center. MQG Derivatives discussion - National has pulled their blog posting on this topic and apologized for the confusion it caused. Giedra did hear back from Chris Thompson (Tattooed Quilter) but it looks like the December date would be hard to fill for members plus response seemed lukewarm on the topics he was willing to teach. A straw poll of members in attendance indicated that members would be more interested in bringing in a local teacher - possibly even utilizing some of our own guild talent. Also suggested that we ask Brenda for teachers that are close by (so not necessarily guild members but maybe less of travel expenses). Might want to check into what Chicago guild has to offer and/or teachers they've brought in. A proposal has been brought to the Board to withdraw from MQG in 2107 because of how much it costs versus the value received for all members. The Board has decided to see if it is feasible and to investigate the pros and cons. A straw poll was taken of members present and about 50% stated they would like to withdraw and 50% stated they didn't care one way or the other. There was no one who said they would like to keep paying membership to National. Members present did indicate that they would like to see a list of the benefits that national provides members. Our October (Oct. 26) and November (Nov. 30) meetings will still be at Cavalry. A Question was asked what the cost would be to have an extra day (beyond our two meetings). The Board will research this and get back to everyone. It was suggested that the Board look into the Craft Industry Alliance. Quilt Show Committee - a committee has been formed. Interested in joining? Contact Amy D or Debbie G.
Elections - reminder that elections are in January. It looks like all the existing board will run again, but competition is a good thing. Feel free to nominate yourself (or have someone nominate you) if you'd like to run for any office. What I did for Whoot! App gives the choice between triangles or squares. You can also adjust how many squares by how many you want. The less squares, the easier to do, but you may lose detail. More squares = more detail. Click "Mosaic" and see if you like. If not, go back to your graphic and adjust. You can also decide how many colors you want. Again a balance between enough color to detail your graphic and not too much to make it a nightmare to match colors. I chose 5 for Whoot! which turned out to be perfect for the Michael Miller challenge fabric I had on hand. Swap ensued - favorite fat quarter swap. Secret Stalker next month. Giedra has not heard back from Christopher Thompson (The Tattooed Quilter) on our proposed class for September 16/17. Following discussion on how to proceed, the Guild suggested that we not try to push for this date as it would only give us one meeting to get attendees. Giedra will continue to try to connect with him and possibly set up a different date, but she will also try to connect with other teachers. One suggested teacher would be Kristi Schroeder, Initial K Studio. She also is suggesting we have a get together on that weekend instead. Creative Passions Retreat - a positive report was given regarding the retreat this month (clean, comfy, good lighting/seating, also lots of room in the building we were at (CP2)). Main negative was that we did not have the attendance so the guild was on the hook for more money than was covered by attendees. Fortunately, the owner of Creative Passions agreed to allow us to take the extra amount and use it as credit for a future retreat instead of just losing that money. Bring a Friend to Quilting - Amy D is planning this event for the October meeting. We would have demos on methods/techniques, modern quilting vs traditional, tools, tips, etc. She will be asking for volunteers, so anyone who would like to participate are encouraged to contact her. We discussed that this is the meeting we will be doing our Secret Stalker Swap so we would curtail most of our regular meeting items to allow time for all. Charity quilts - we showed off the quilts in progress (some completed) for Quilts for Pulse project for Orlando. All quilts to be done by August meeting and we will ship them as one package. There were also a couple finished for the Veterans (Red White Blue). Yay Guild! Next month's challenge is our UFO challenge - pick something that has been languishing, finish it and bring it to show off. Also next month we will be choosing our Secret Stalker partners. This time we will be including scraps from your own collection that your stalker can include in the mini. Project will be to create a mini that fits the person you are stalking, incorporating at least some of the scraps your partner has provided. 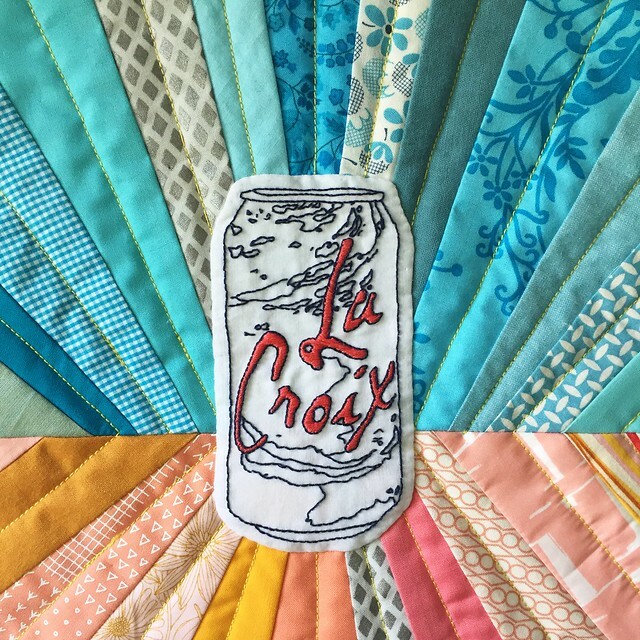 You do not need to use all the scraps or feel you need to make the entire mini out of them. Tonight's swap was Pouches! Yankee swap ensued. Fun was had. Greater Ann Arbor Guild Quilt Show - please support our 'other' A2 guild next weekend at their bi-annual quilt show. It will be at Washtenaw Community College. Sat 9-5 and Sun 11-5. There will be vendors and over 300 quilts including many from our own guild. Cost is $6 and entry can be used both days. APQS (longarm vendor) will be in Canton at the Hampton Inn on August 2nd if anyone is looking to test drive a longarm. We discussed options for fund raising for the guild. It appears to be the consensus the members would prefer a raise in dues to pad the coffers instead of dealing with fund raising. The Board will take this up at a later date. If anyone is looking for a Featherweight, Amy S has a friend who is selling one for $300. Contact Amy for more information. Jude suggested we consider for our charity quilts the Child Gynological Cancer organization which helps children age 5-18 going through this. They collect lap quilts and give them to the children when they start chemo and are looking for about 10 per year. This will be passed to the Board and Charity Chair for consideration. Jude also noted that she needs a place to stay (lodging) at QuiltCon in Savannah so if anyone can assist her, please let her know. Library list has been updated - pdf on blog (Kathy will be uploading it in a few days). Kim will not be lugging as many books to meetings, so if you have ones you want her to bring, let her know prior to each meeting. Skill School - Debbie Grifka shared how she creates a "Skinny Binding"
She cuts 1-1/4" wide strips. These are not double folded. Thanks to Amanda Coulter for stepping in and taking notes! Foodie Challenge: The winner of the challenge (by a landslide) was announced (Brenda Rowley-Gray, with her entry of "Carrots"). The guild thanked Giedra for her considerable work in coordinating the challenge. Charity Quilts: We collected quilt blocks for both the Red/White/Blue quilts, as well as Quilts for Pulse. Those interested in contributing who have not yet had the chance can bring finished charity quilts to the August meeting. 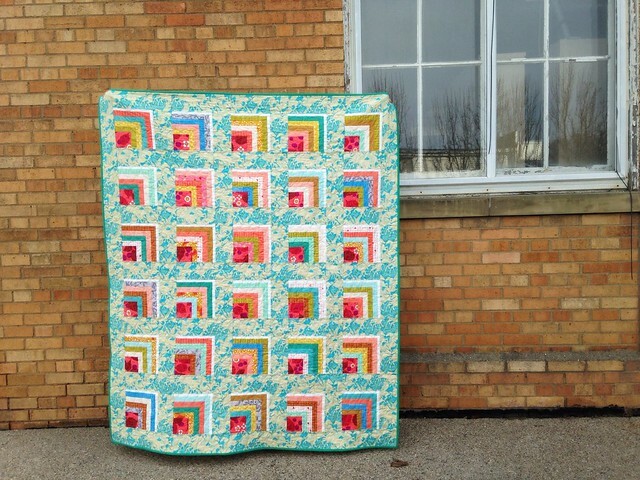 At the July meeting we may need to solicit volunteers to help finish / assemble and quilt the charity quilts. July Retreat: The July retreat was planned for July 14th - 17th at Creative Passions in Chesaning, MI. Amanda alerted the guild members that we are many people short of making our minimum required for attendance without losing Guild money. We encouraged more people to sign-up, and collected payments from those scheduled to attend. 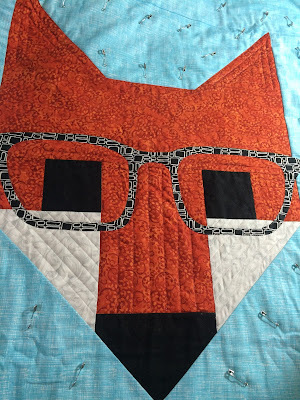 October Meeting’s “Introduction to Quilting” event: We will have a science-fair-style event at the October meeting. 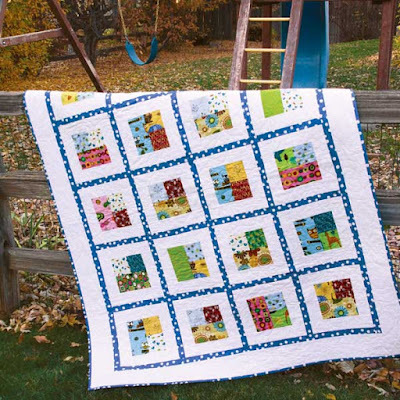 The purpose is to introduce newcomers to the stages of making a quilt. We will man different stations set-up around the room (e.g. cutting, quilting, fabric selection, etc.). 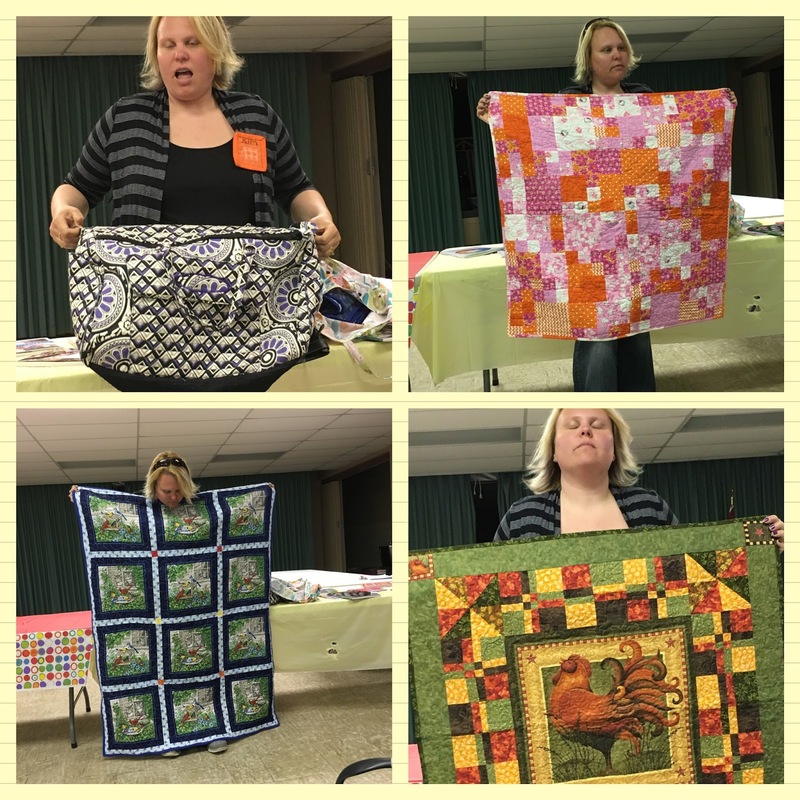 Members are encouraged to bring people to that meeting who either may not know much about quilting, or who might be interested in joining our group. We may have a raffle and/or prizes, and we will be looking for volunteers to work the tables. July Swap: At our July meeting we will exchange quilted pouches. The guidelines are that pouches must: (1) be a pouch; (2) have a closure; and (3) be quilted. This will be a Yankee Swap. There are no size restrictions, and zippers are not required. Additionally, pouches may be empty (but need not be empty if you are so inclined to fill them). Library Spotlight: Kim noted that Amy and Allison contributed new books to our library. The list of all our library books has not yet been updated, but will be. Members should send an email to Kim U. to request a particular book for a future meeting. 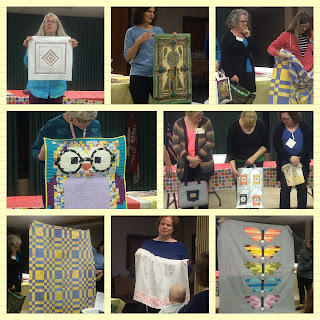 NEW Spotlight Format: Future meetings will include a new section where members will “show” or “share” something about quilting, in order to get to know each other as members better. 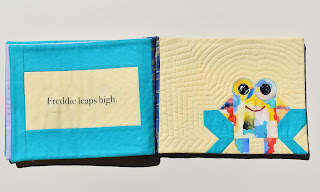 At this first updated session of Spotlight, Giedra shared a tiny paper piecing project which was inspired by Rashida Coleman Hale (from Cotton + Steel). Jackie shared the Carolyn Friedlander book “Savor Each Stitch,” and explained a project she made from the book. 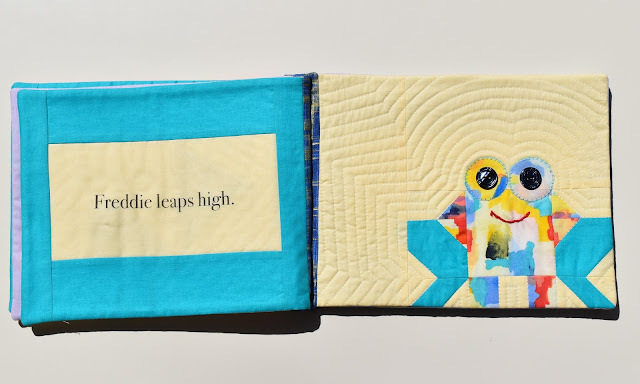 Amy P. shared that when Carolyn Friedlander spoke to our guild at a trunk show, Amy was inspired by Carolyn’s comments on “slow stitching,” and it made Amy focus on the process rather than the end product. 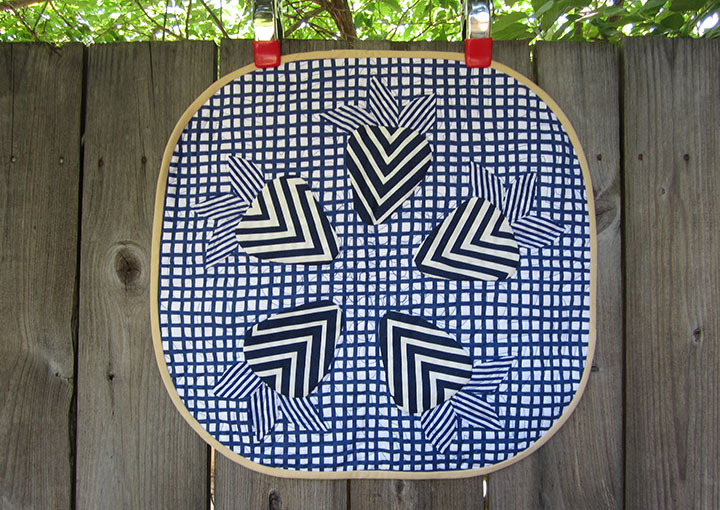 Amy S. shared a quilt she made based on a pattern from Debbie Grifka, but adapted to ⅓ the scale. 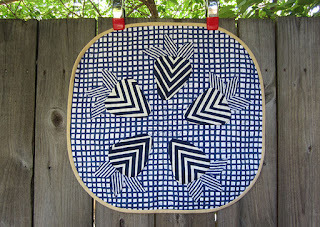 Amanda shared an idea she is formulating for creating a Sashiko-inspired quilt. Skills School: Amy S. demonstrated her pattern for a “Scrappy Snowball.” This pattern includes a paper template. 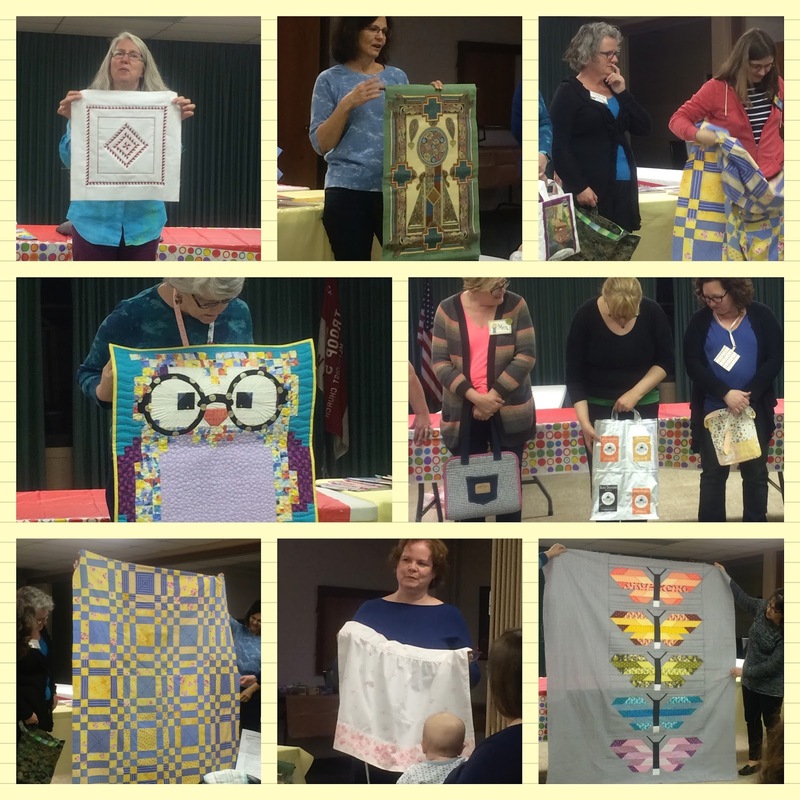 Round Robin: Participants shared progress on round robin quilts, and received new assignments. Members are reminded that they can join at any time! Miscellaneous: For anyone interested in attending the November Glamp Stitchalot event, Ida has a ticket to sell. Contact Ida for details. The Board has decided to support the Orlando Quilts for Pulse project. Regardless of your political or personal views, we hope that everyone will join in and make at least one block (but hopefully more!) to support this effort to send a quilt to each victim or their family. The Guild has been signed up to make at least one quilt, but we are hoping that the outpouring is so great we will be able to send even more. 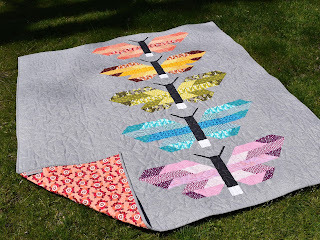 If you are not able to make a block, hopefully you will be willing to piece blocks together, do the quilting or the binding. Basically it can be any block but the simple one the MQG shared goes together very quickly. Looking for 10-1/2" blocks in rainbow colors with low volume background. Size of finished quilt in case you are very ambitious would be around 5x6 blocks to make a 50"x60" quilt. Please bring at least one block to the June 29th meeting where we will coordinate the piecing effort. The quilt(s) are due to Orlando September 15th so we have a bit of time but the sooner we get these completed, the better. Charity Quilts: next month bring red-white-blue blocks (any combination). Should be 12-1/2" blocks (to finish at 12" to make 3x4 block quilts for Veterans). Still looking for donations of modern fabrics - we now have a fabric bin. Also are looking for volunteers to do shared quilts (someone does cutting, another piecing, another the quilting). Foodie Challenge: we showed off our finished mini-quilts. Show at Zingerman's has been extended by one day to give the Glamp attendees a chance to see them. June 2-5. Winner will be by popular vote (vote at Zingerman's). Prize sponsored by the Deli and Pink Castle Fabrics. SUMMER: Amanda reported that there are 4 options for a summer retreat (3 Howell dates (Jul 15-17, July 22, Aug 28) and one opening at Creative Passions also on Jul 15-18). A show-of-hands vote indicated a preference to try Creative Passions so Amanda will book that. July 15-17, $140 with continental breakfast and optional Thursday arrival (add'l fee). There is a 24 maximum attendance. She notes that we do not need to bring our own linens for this venue and supposedly has good chairs and restaurants near-by. www.creativepassionsllc.com/ 203 Pearl St, Chesaning, MI 48616. Amanda will send an email with details to the group - plan on paying at next meeting. WINTER: We will go to Hankerd Inn, planning on Jan. 27-29 weekend. Member Spotlight: Postponing for awhile. Giedra will announce something different at next meeting. Amy has gotten very into handwork recently, and has a post with her many handwork projects in progress. Come out for the show; these are just two of the many awesome mini quilts created for this challenge. 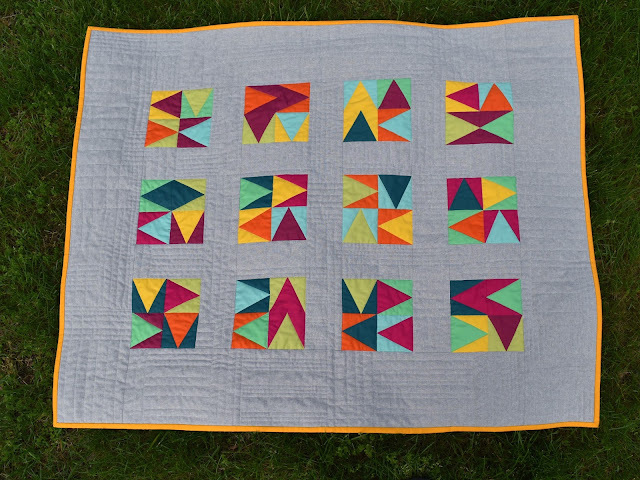 Karen has another baby quilt up...this time in brights, with groupings of blocks into varying, patternless shape sets, for a fun and visually interesting effect. 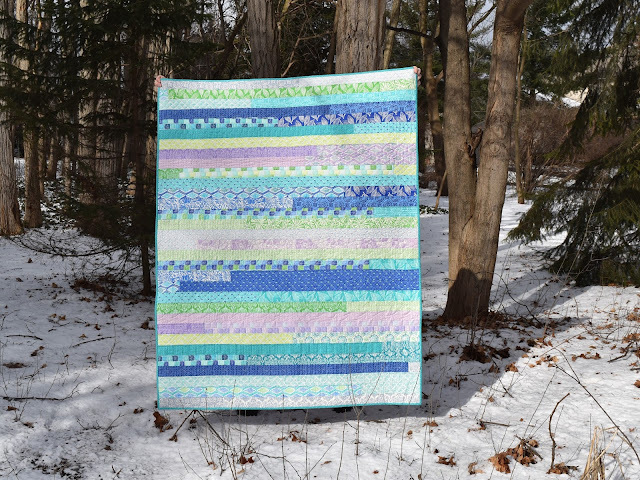 And finally, Lynn posted both about her quilt "Off the Charts" from her book, and also a really lovely quilt she made for Oakshott, "Crepuscular", and she provides a pattern, too! Her April and May Charity Challenge posts are up with patterns, and she has got a new "Minimal Mini" series going. See also MM3 and MM4. Karen finished the Frances Firefly she started at Sewtopia Atlanta and her quilting idea (emulating the dart-y motion of a firefly) is rather interesting, right?